In large bowl, whisk oil, cilantro, vinegar, cumin, salt and pepper. 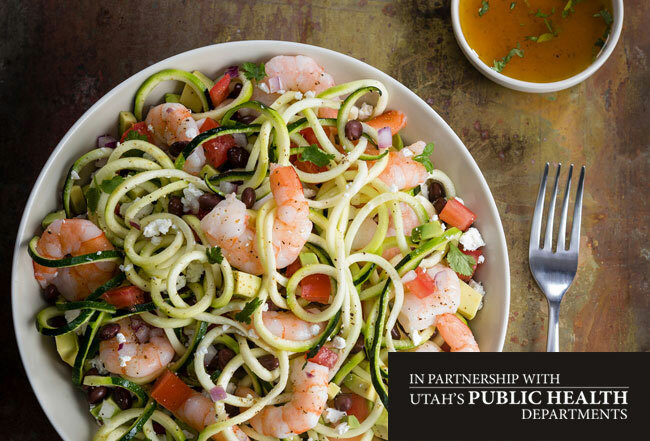 Add Zoodles, beans, shrimp, tomatoes and onion; toss to combine. Fold in avocado and cheese. Zucchini noodles are an excellent source of vitamin C and lower in carbohydrate and calories than most other noodles. Consider serving with a carbohydrate-based side or using this dish to balance higher carbohydrate meals in order to manage carbohydrate intake to about 60-70% of your daily caloric intake.